It’s silly season and despite ignoring Black Friday and the like, I’ve been buying gifts and presents for friends and family. Of course, a fair chunk of my income also went towards my holiday too instead of being saved/invested. A savings rate of 29.5%. 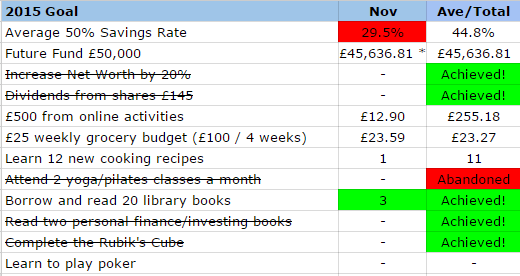 Hmmm…not bad compared to average UK savings rates but this is my worst savings rate since I started my blog! This takes my average down to 44.8%. The good news is that although things aren’t going to be any better in December, I should be able to maintain a >40% average, which I won’t feel too bad about. This month’s savings was topped up with £12.90 from TopCashBack* and £80 from rent received. My Future Fund now stands at £57,023.34, buoyed a little by improving markets this month. Net Worth is now £114,802.96, an increase of just over 28% so far from the start of the year. I received £3.26 from British Land Co plc, £3.05 from Ladbrokes plc, £3.64 from Centrica plc, £2.19 from Vanguard Government Bond ETF, £2.85 from City of London IT, £1.80 from Bankers IT plc and 67p from Bloomsbury Publishing! 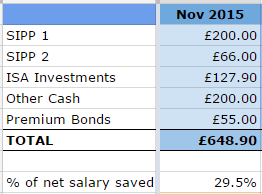 Anyway, this brings my monthly dividend income average to £24.67, with total dividends received in 2015 now £271.36. There’s a good chance that I will hit the £300 mark by the end of the year! I didn’t invest in shares or investment trusts this month but my transferred personal pension has been invested in various ETFs (exchange traded funds), one of which (Vanguard Government Bond) has already produced dividends. Food/Groceries Budget – I spent £94.37 this month, averaging £23.59 per week. My average weekly spend so far is now £23.27 so unless I have a big blow-out next month, I will achieve my goal. Incidentally, I’ve just realised that my average dividend income actually covers my weekly shop – sweet! Cooking Recipes – TheFIREStarter gave me the idea of making a fish gumbo – it’s great with my homemade bread! Online Earnings – I’m well short of my £500 target in online earnings but as mentioned before, I think I was a tad massively over-optimistic when setting the annual goal. Still, another payout from TopCashback as listed above. I have around over £100 in the cashback pipeline as show at the end of this post, but most of it won’t get paid til next year. Library books – My target of reading 20 library books was achieved this month – woohoo! I’ve been working 4-day weeks in November to use up my holidays and instead of watching day-time TV, I’ve been enjoying a lot of uninterrupted reading! Really pleased I’ve achieved this goal and will definitely set it again for next year to make the most of local services, read new books and not spend any money needlessly on reading material! If anyone’s interested, I track all my reading via GoodReads – add me as a ‘friend’ if you are a member! Ok, it looks likely that I will achieve the cooking and grocery goals but not the savings rate, Future Fund, or online activity goals. The poker one…well, I know how to play now but not to any high standard, so not sure what to do about that one. Just one more month left in 2015 – how time flies when you’re having fun! Wishing everyone great strides towards FI as we see out this year! This entry was posted in Dividend Investing, Funds, Net Worth, P2P, Portfolio, Savings by weenie. Bookmark the permalink. The Christmas run up is always a killer – but still being able to save nearly 30% is a huge achievement, dont forget that as you say compared to the majority of the UK….! If this covers most of your expenses for Christmas then thats a great result! Keep up the good work – and as you say the increase in dividends from last year is huge, its slow but steady progress – as the dividends increase you get more and more to be able to add new funds and the snowball starts! I know the pain November is usually my worst month as well. Christmas and few birthday in the same month are the killer. You are still maintaining SR at around 45% just a little bit more saved in December and you will go over 45% which is more than most people can dream about. I have a question since you are single at the moment did you ever consider going with Goverment rent a room scheme https://www.gov.uk/rent-room-in-your-home/becoming-a-resident-landlord? That would allow you to rent one room in your house for tax free £4,250. I am considering doing this if we buy a house next year for a year or 2. D'oh lowering your overall savings rate quite a bit. But like you said, that number is still significantly higher than the UK average. I'm sure you'll be able to bump up that number in the near future. Keep up the great work. Still some Christmas expenses to come in December and it's not looking great but I think for the first time in a while, I feel like I'm in control of my expenses! I'm looking forward to the dividends growing more and more but need to ensure that I don't get too impatient, the snowball takes time! Thanks and wish you a great festive month too! While I'm quite confident I can keep my savings rate >40%, 45% might be a stretch too far, as I still have a fair amount of expenses to account for. However, as I mentioned to London Rob, I feel like I'm in control of my spending. To be honest, although I'm aware of the rent a room scheme, it's not something I've considered. Whist I am pursuing FIRE by cutting down on expenses and saving and investing as much as I can, I'm not willing to sacrifice my personal space by renting out to a stranger, even if it does mean that I can make money tax free. If I hadn't paid off my debts by now, then renting a room would probably be considered but I'm not so desperate for that extra cash. Hope it works out well for you though. I know! A week into December and I know that number will drop again but I am confident that I will turn things round in the new year. Thanks for stopping by. Have a great holiday! It is something to look forward to (if not already taken) and one should have always something to look forward to anyway. I do have a question. what is the average UK Saving Rate? 🙂 I have seen it mentioned many times, but not the actual number. To be honest, I didn't know the exact figure, I just knew it was low! I've just found an article which stated that the current average saved for retiring is £142 per month (http://www.thisismoney.co.uk/money/howmoneyworks/article-3177112/How-money-need-save-pension.html). Couple that with the average UK salary of £26,500, this suggests a savings rate of around 6.4% but I'm sure I've seen the figure lower than this somewhere. Thanks for posing the question – I must try to find the actual numbers! Thanks very much for those links, in particular the Scottish Widows one, very interesting read! Yes, I'm doing better than average but still….must try harder! Yeah, December is a terrible month – I am taking a hammering (a lot of work related expenses), but as you say at least you are in control of the expenses, and it brings a real focus on the spending side to resist! In terms of the dividends growing – keep the patience! I got really quite down about it in about year 3 / 4 as it just seemed I wasnt making progress despite putting money away regularly and it all seemed pointless. I slapped myself a bit and also followed the trick of putting a table in my spreadsheet where I could see exactly how my dividends were growing, so month on month how much I took back. That gave me the desire back and sorted things out! Glad you liked the fish gumbo idea! Quick question, I noticed that there is a wordpress site at quietlysaving.co.uk but I couldn't comment on it unless I was logged in, so tried the old blogspot address and can comment here still. Is the WP site fully working now or should we use this one still for now? Wow – how eagle-eyed were you, to spot my new blog, haha!? It's not fully working yet – I was hoping to just convert from Blogger to WP last weekend but there's some work I need to do before it's reading (pages and formatting etc) so I'll probably work on it over Xmas and then launch it in the new year. So yeah, for now, continue with this blog. Cheers and wishing you a great run up too! PS – fish gumbo tonight!